Should we take back the Solstice? The Heritage Journal is about raising awareness of ancient sites and this article by sociologist Tom Shakespeare suggested a way. He says when he looks at other cultures he has “a strong sense of festival envy” – for instance Solstice is often widely celebrated abroad but far less so here and he thinks we’re the poorer for it. Maybe it’s because solstice is portrayed in the British media (and the EH website!) 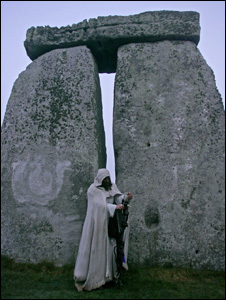 as about Druids, pagans and other enthusiasts gathered at Stonehenge. They’re entitled to do their own thing but it may cause others to see it as someone else’s festival, not theirs. That’s quite wrong though, it’s everyone’s – it didn’t start with Stonehenge but far earlier, with Mankind!